As one might expect with a system of coded symbols the tinctures themselves have meaning attached and one can often begin to read more into the message conveyed by the original bearer of the arms. Over time many of these meanings have changed, but there are still certain themes that can be picked up and I outline below the commonly accepted ones. The exact colours employed in heraldry are usually left to the heraldic artist, whilst remaining within loose bounds. In 1934 the British Colour Council published a Dictionary of Colour Standards in two volumes, one showing 220 colours presented on pure silk ribbon, named, numbered, and coded, and the other giving the history of each colour, the various names by which each had previously been known and the authority for standardisation. 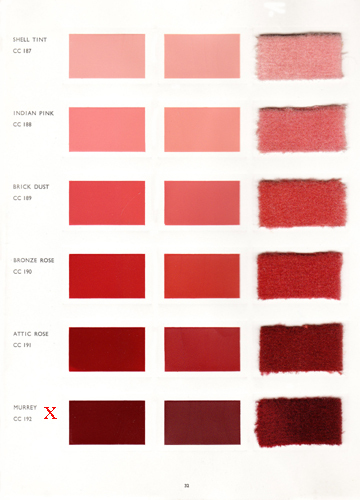 Amongst these were seven of the above colours, the purpose of which was to provide a guide to selecting appropriate shades. As the British Colour Council developed its services to industry it became apparent that the bias in the dictionary towards colours for textiles made it less relevant as a standard reference work for Interior Decoration. In 1949 it published the Dictionary of Colours for Interior Decoration, which is discussed in another post. Volume 3 of that work listed the colours and provided a brief history of those illustrated in the other two volumes of colour samples. Under the heading Heraldic Colours it provided details which had been supplied by Somerset Herald2 at the College of Arms. “These heraldic terms date from the early thirteenth century, when heraldry became established as a science. The heraldic colour names are mainly of French derivation, or influenced by Latin. The names are still used in heraldry today. As this metal tarnishes it is usually represented by white. It was not illustrated. Argent is understood to represent peace, sincerity innocence and purity. Blue from Old French azur. Azure signifies piety, sincerity, loyalty and chastity. 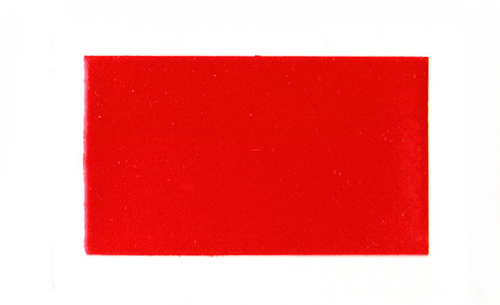 This was not illustrated in the 1949 edition, but it appeared as Larkspur (BCC 196) in the Dictionary of Colour Standards of 1934. A recent project of mine saw me researching the heraldic Beasts of King Henry VIII for a recreation of a Tudor garden at Hampton Court Palace. As well as identifying which beasts were relevant, I also had to establish how they were to be painted and where each of the tinctures were to be applied. Jane Seymour’s Heraldic Panther. Tudor Garden, Hampton Court Palace. The heraldic panther resembles a leopard. However, it is silver and covered with spots of blue and red and has flames issuing from its ears and mouth. Jane’s panther, which is collared with a coronet and chained, was the dexter supporter of her arms. A panther had been counted among the number of royal beasts since the time of Henry IV and possibly earlier. In this example one can see the following heraldic tinctures: Argent; Or; Gules; Azure and Vert. The latter is shown in its sixteenth century form, for at that stage there was only one satisfactory pigment to achieve a green colour in oil paint – Verdigris. Experiments carried out with it show that when first applied the colour is a very blue green and it is this form that has been used here. However, it becomes much yellower with time and exposure. As can be seen below the present green colour used in heraldry tends to be much yellower. This is from the French vert meaning green and, in turn, from the Latin word for green – viridis. Vert is symbolic of joy, youth and beauty and demonstrates loyalty in love. 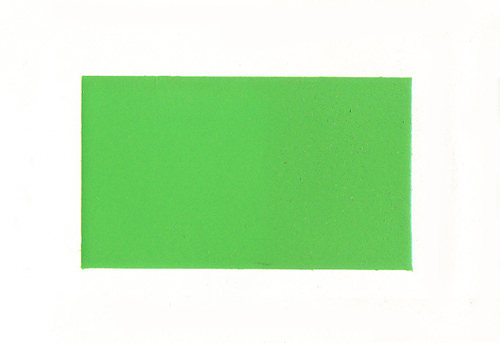 The Dictionary of Colours for Interior Decoration shows this as Apple Green (CC 98). 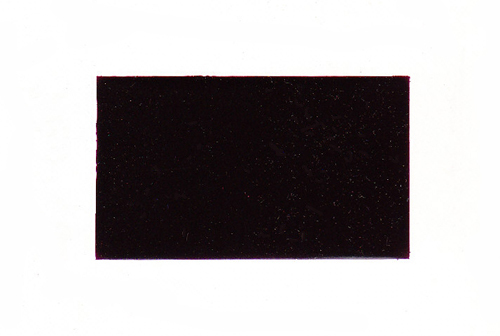 The word comes from the French sable meaning black. Sable denotes the qualities of knowledge, piety, Constancy, serenity and work. It was not illustrated in the Dictionary of Colours for Interior Decoration. The word comes from the Latin purpura, meaning ‘purple’. Purpure suggests justice, temperance and sovereignity. The use of this colour is rare, although ancient examples do exist – for example in the arms of Henry de Lacy, Earl of Lincoln in the thirteenth century. The Dictionary of Colours for Interior Decoration shows it as Prune (CC 305). This emerged in the twentieth century, in response to wartime requirements of the Royal Air Force. This is the colour of mulberries. 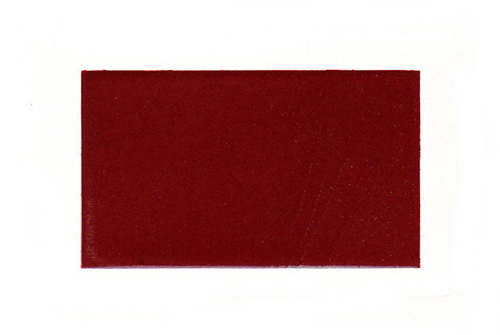 The name is believed to come from the Old French moré and is sometimes referred to as Sanguine, the colour of blood. In the sixteenth century it was used as one of the two livery colours of the House of York. Murrey is meant to indicate patience in adversity. 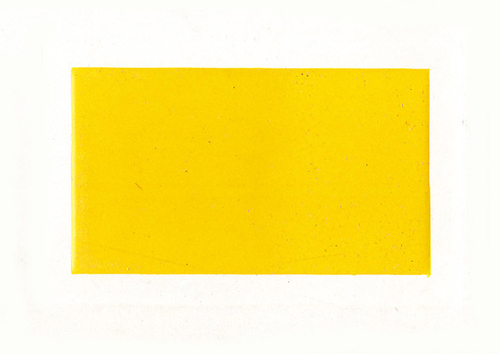 The Dictionary of Colours for Interior Decoration shows it as Murrey (CC 192). This colour is sometimes known as Tawny and is of an orange hue. This colour is meant to signify ambition. It was not illustrated in the Dictionary of Colours for Interior Decoration, but it appeared as Mace (BCC 73) in the 1934 edition. Tenné also appears on a coloured silk ribbon in the magnificent volume of Traditional British Colours that was produced for the Coronation of His Majesty King George VI in 1937. Another word is often encountered in connection with heraldic colour and that is the term proper, which is used to indicate that something is in its natural colour or shape, for example an animal or plant. The blazon is the written description of a coat of arms. At first this might make little sense, but once understood it will be seen to be masterpiece of concision and will enable one to visualise the arms. I think that one can see immediately that the formal blazon is more succint and less inclined to cause confusion. 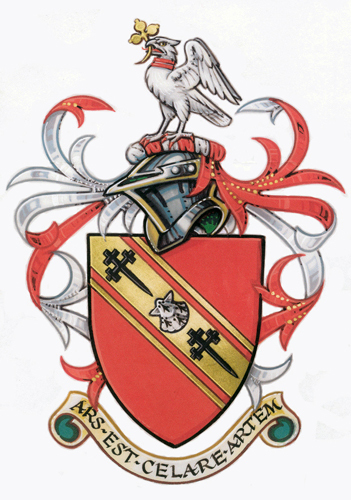 In the above arms over twenty references have been worked in to the design. Most will only be known to the bearer himself, but some will begin to become clear with a little thought. How many of these clues can be picked up? Never place a metal on a metal – for example a silver on a gold shield. Never place a colour on a colour – for example a red lion on a blue shield. A fur can take the place of a metal or a colour. Note how these rules have been obeyed in the arms featured at the top of this page, where a gold bend has been placed over the red shield and how the superimposed crosses are black and the scallop shell is in ermine rather than silver/white. In addition to metals and colours heraldry also uses furs. These are really patterns that suggest the costly furs worn by the medieval nobility. The two main ones being ermine and Vair. On the left can be seen the coat of arms of the former Duchy of Brittany described by one of the few known one-word blazons in existence, simply Ermine. 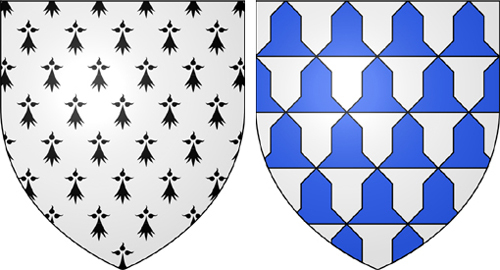 On the right, I believe, are the arms of the Counts of Guisnes. 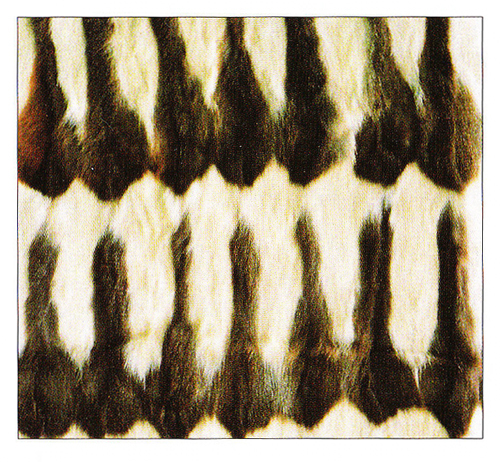 Here is a photograph of a real piece of vair – the fur has been made from the back and front of squirrel pelts sewn together. The use of the word vair in this post has prompted a comment about a possible mistranslation / mistranscription in the original story of Cinderella, which has long been a cause of puzzlement. This concerns her glass slippers. The story appeared in Charles Perrault’s Histoires ou contes du temps passé avec des moralités, which was published in 1697.3 It has been suggested that pantoufle de vair (fur slipper) might have been mistaken for pantoufle de verre (glass slipper). 1 I have tried to use the word “tincture” when it applies to the full range of colours, metals, furs, ‘stains’ and ‘proper’, while keeping “colour” when it applies to what one might generally consider a colour, but as you see it does get a bit confusing. 2 In 1934 this was Sir George Bellew. He later became Garter King of Arms. 3 Cendrillon ou la petite pantoufle in Perrault’s collection, which in English is known as Stories or Tales of Olden Times with Morals, or also Tales of My Mother Goose. I am grateful to Sarah Waldock for pointing this out and to Mark Liberman for the more detailed explanation. A.C. Fox-Davies. A Complete Guide to Heraldry. Skyhorse Publishing. 2007. Stefan Oliver. Introduction to Heraldry. David & Charles. 2002. Stephen Slater. The Illustrated Book of Heraldry. Hermes House. 2002. Thomas Woodcock and John Martin Robinson. The Oxford Guide to Heraldry. Oxford University Press. 1988. Thanks, this is a very informative piece, I’d not come across tenné before. A shame the prune looks black on screen but then it’s remarkably difficult getting colours to come up as they are…. Vair represents the Russian squirrel which had a blue grey back and white belly. As I understand it, the shape of the vair is supposed to be a stylised version of the whole pelt laid out. You have to have a good imagination I guess. Anyone else immediately think of Charles Perrault and pantouffles of vair not verre? Thank you Sarah. Yes. I’m sorry about the prune. It is very black in the Dictionary too. As to Perrault, you have prompted me into adding a photograph of some squirrel pelts, which back up what you say very well. I have also added a brief account of the possible mistranslation in Cinderella. Many thanks. I would like to know how I can get a tile in the official color: Larkspur Blue 196 (BCC.) The Aruban Flag was design with this colour, but now the fabricators can’t match the official colour. I think that in the USA a larkspur blue is more like a purple-blue and that is confusing. We get the flags in different shade of blues from a dark blue to a very pale one. So I would appreciate it if you can help me with this problem. Also paper samples tend to bleaken in the climate of Aruba, so the reason for a ceramic tile. Thank you for your very interesting query. Unfortunately, although I could mix up a tin of paint in that colour I have nothing to do with ceramic tiles. I was going through and naming my Dragons in a game called DragonVale and couldn’t remember some of the colour names in heraldry. So I googled it. Up came your site. I became so excited, again, about my past heraldry experience. I at one time belonged to a group called SCA, Society for Creative Anachronism. Oh what fun. Being of an artistic nature I became known for the garb and heraldry. That led to painting shields for a few Irish bars in New Orleans. Lol, what fun. The hard part was finding someone to build the shields. Well, just wanted to thank you for the site. I’m going to try to find the colour books you mentioned to add to my collection. Yes I could have gone to my collection to look it up but Google was faster. Now I’m looking through my collection. So thanks for that too! Thanks for getting in touch. I am delighted that you found the essay of some use.